Way back in August I told you about an event I went to that focussed on beauty at home. You can read about it here if you missed it. One of the brands that was showcasing there was eSalon. 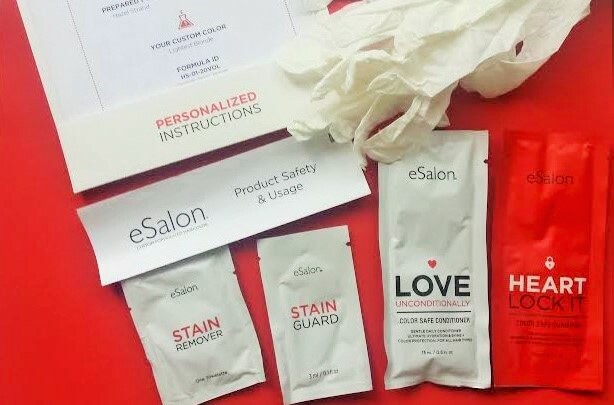 The idea is that you get individual hair color, crafted just for you, with personalised instructions for easy at-home application. It’s been developed by renowned master colorists and the advanced formula has high-quality ingredients for rich, long-lasting color and superior grey coverage. You get to order your product on-line. The hair colors aren’t pre-stocked and every order is custom blended, bottled and packaged, then sent to you as soon as it’s completed. Now I have to say that it did take a while to arrive but it was sent from the US so that could account for it but I’m not sure how patient I would be in future as once I’ve decided I want something I want it immediately! Still the aim is to bridge the gap between the uncertainty of retail products and the excessive expense of salons. They take into account your natural hair color, amount of grey hair, previous color applications, hair texture and condition, desired color. The personalised instructions are customised for each individual client. How was it for me? Well first let me say that I love the end result. The colour is subtle and my hair is shiny. But there were one or two things along the way that weren’t quite perfect for me. So, back to the beginning. I loved the quality of the gloves, so often these kits have really flimsy gloves that tear. The mixing process was standard and I applied the formula to my grown out roots. I’d given this information on-line so the formula was specially designed to be applied in this way. I set the timer for 35 minutes, again the timing is prescribed for my kind of hair. The next part was a bit tricky. With my usual home colour I spread the rest of the product over the lengths of my hair for a few more minutes before rinsing. The directions were to add water to the remainder of the mixture and then get in the shower. (They advise this “as this bit can be messy”) Then I was told to pour the mix over my hair and massage it in – but this is where things went wrong the mix went in my eye and so I wasn’t able to massage it in properly as it was painful so I just rinsed everything off and applied the shampoo and conditioner. Fortunately I had already cut the sachets open and had them to hand or I would have been in trouble as I couldn’t really see where they were as my eyes were still stinging! Anyway here’s the link to the 50% off trial if you’d like to give it a go for yourself. There are also plenty of other hair products to browse and order. I’ve tried a couple of those too but I’ll tell you more about those another time as I think I’ve rambled on enough for one post! Do you colour your hair at home? What brands do you use? This product was gifted to me for review but the opinions are my own and not prescribed.